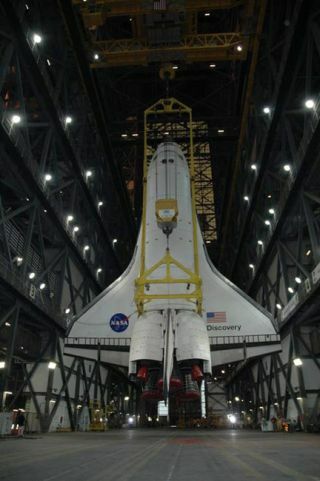 The orbiter Discovery is suspended vertically above the floor of the transfer aisle of the Vehicle Assembly Building in preparation for NASA's STS-116 mission. NASA space shuttle managers formallydecided Thursday to push back the launches of three orbiter missions in 2007 toallow extra time for spacecraft processing. "It's acombination of processing and orbiter turnaround," KyleHerring, a NASA spokesperson at the Johnson Space Center, told SPACE.com. Herring added that shuttle external fuel tank preparations are a priority: "We knowthat the tank processing is one of the critical path items and has been since return to flight." NASA'sfirst shuttle flight of 2007--STS-117 aboard Atlantis--is expected to carry newfuel tank modifications when it launches no earlier than March 16 on a missionto deliver new solar arrays and truss segments to the International SpaceStation (ISS). The shuttleEndeavour will follow no earlier than June 28, on NASA's STS-118 mission, toadd another truss segment and a spare parts storage platform to the ISS. Those missionspave the way for the planned Sept. 7 launch of Atlantis' STS-120 mission to install a U.S.-built hub [image]that will link future laboratories to the ISS. The threeshuttle missions were originally slated to launch on Feb. 22, June 11 and Aug.9, respectively, but were pushed back to accommodate shuttle processing needs,as well as plans for upcoming ISS astronautspacewalks, crew rotations and automated cargo shipments. NASA hasscheduled five shuttle flights in 2007 to continue space station assembly. "The othertwo flights are set for October and December in 2007," Herring said. October'sflight, STS-122 aboard Discovery, will deliver the European Space Agency's Columbus laboratoryto the ISS. Endeavour is expected to launch its STS-123 mission in Decembercarrying the logistics module for Japan's Kibo laboratory [image]and Canada'sDextre robotic arm attachment. NASA's nextshuttle mission of 2006--STS-116aboard Discovery--is scheduled to launch on Dec. 7 to add a new trusssegment to the ISS and rewire the outpost's electrical grid. At least 14shuttle flights, including STS-116, are expected to completethe ISS by NASA's September2010 deadline, when the agency plans to retire its three-orbiter fleet. The flightschedule also includes room for a pair of extra ISS-bound flights to haul spareparts and other items to the orbital laboratory, as well as a 2008 flight toservice the Hubble Space Telescope.